This is not a stand-alone deck; an A Game of Thrones: The Card Game core set is required to play. As the warm embrace of summer releases its grip to the harsh winds of winter, the continent of Westeros is in turmoil. The change of seasons will send the timid and the weak into hiding, longing for better times. But for the cunning, the opportunistic, and the bold, the chaos surrounding the onset of winter will be seen as the means to power! A Change of Seasons is the third installment of 60 fixed cards for the A Time of Ravens expansion to the A Game of Thrones card game, based on George R.R. Martinâ€™s bestselling A Song of Ice and Fire saga. It contains 3 copies each of 20 different cards designed to augment existing decks and add variety to the A Game of Thrones metagame. 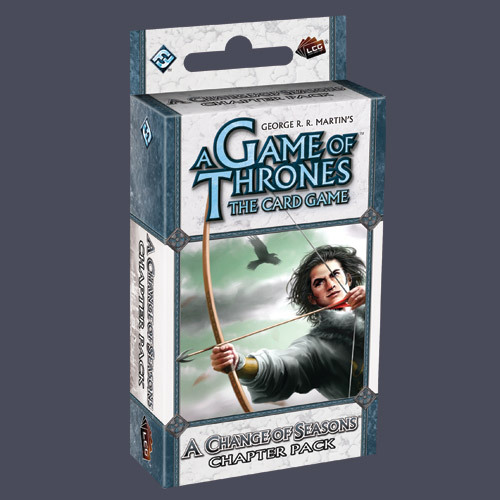 Other products in the "game of thrones lcg" series.